Regional Educational Laboratory (REL) Midwest is working with the Illinois State Board of Education (ISBE) to train teachers on how to use data from the Kindergarten Individual Development Survey (KIDS), the state’s kindergarten entry assessment. The trainings include opportunities for teachers to practice interpreting KIDS observation data from their own classrooms. During the trainings, teachers also begin brainstorming ways to make their teaching more responsive, based on the KIDS results. Teachers complete the KIDS assessment by observing each student and noting their progress across several domains. Following a five-year pilot, all Illinois kindergarten teachers were required to observe and collect data beginning in fall 2017 on 14 KIDS measures across four domains: Approaches to Learning and Self-Regulation, Social and Emotional Development, Language and Literacy Development, and Cognition: Math. Teachers also can collect data on additional measures and in additional domains, although these measures are not required. Teachers must complete the KIDS assessment for each kindergarten student within the first 40 days of the school year. Teachers and districts also have the option to collect data in the winter and in the spring to determine developmental progress. Additional data collection provides more robust reporting and, ultimately, a richer representation of a child’s development. Once teachers observe each student, they can communicate with families about the student’s individual strengths and opportunities for growth. Teachers can use the KIDS assessment results to tailor instruction and provide students with more relevant opportunities to build knowledge and skills. As they begin collecting data, teachers may need some guidance on recording what they observe or turning observations into individualized instruction. To help teachers effectively use the data they collect during KIDS observation, REL Midwest and ISBE are hosting a series of virtual and in-person trainings. REL Midwest and ISBE hosted the first round of trainings in November 2017, which included in-person events in Loves Park and Springfield and a virtual event available to all Illinois educators. (Check out the recording from the virtual KIDS data use workshop.) The second round of trainings includes local events in Grayslake and Centralia and a second virtual event in February–April 2018. In addition, teachers who participate in the trainings see KIDS as something that complements their instructional plans, rather than adding more requirements. “Teachers are excited about the fact that they can use this in conjunction with or instead of other classroom assessments,” says Lamb. “It’s not just another thing they need to do for compliance; the KIDS observation-based model fits into other things that teachers are trying to do. 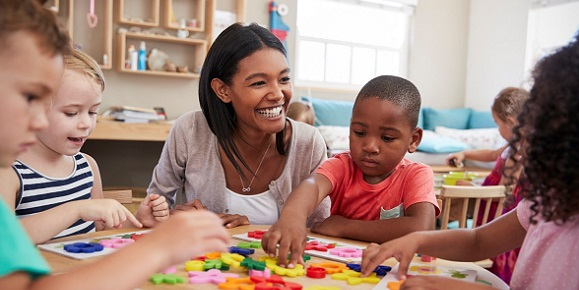 Teachers realize that KIDS can serve multiple purposes.” REL Midwest and ISBE will continue providing guidance to make the KIDS assessment a usable and relevant tool for kindergarten teachers.